Daft Punk’s awesome score to Tron: Legacy was released twice on vinyl LP. Both were limited editions with one being a special edition 180 gram release. 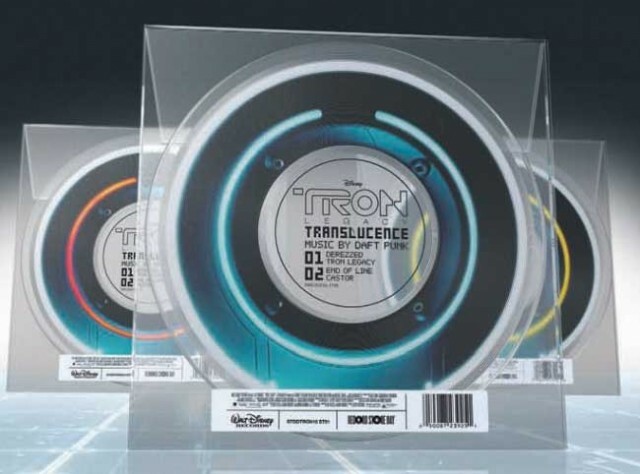 What slipped under many collector’s radars (and still remains unlisted with many vinyl specialists) was the special edition April 2011 Record Store Day release of the 10″ Tron: Legacy EP translucent vinyl identity disc. 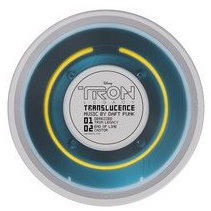 A limited edition release and now extremely rare, the translucent identity disc EP was released in 3 different colors: orange, blue and yellow. They were released across 18 different countries around the world and included the rare track “Castor”. This release comes packaged in a see through sleeve for full visibility of the vinyl identity disc. Now, I can’t find all the colors of this identity disc anywhere, but right now there are two that I can find: blue and yellow. This post links to the yellow one.